I had a very strange dream this morning about researching ancient texts for information about dragons. In the dream I was in my grandfather’s workshop with a person I’ve never met and we had maps and printed articles spread out on the workbench by the doorway. As we looked at these articles the other person told me I should try to find information about “anatolian dragon”. In the dream I tried to type the term onto my iPad to do a search but I kept hitting the wrong keys. I tried again with a stylus but still couldn’t get it right. I was getting more and more frustrated but decided I would look it up on my computer once I went home from my grandfather’s place …then I woke up. 2. What is a motif, motifs of legend? I should do further research on this as I’m sure there is a lot more information about Anatolian Dragon(s) than what is in the article above. Over time many different peoples have inhabited the area known as Anatolia (Carians, Hattians, Hittites, Isaurians, Luwians, Lycaonians, Lycians, Lydians, Mysians, Palaics, Pamphylians, Pisidians, Sidians) so I suppose if I research the myths and legends of those people, in addition to modern Turkish folklore, I may uncover more Dragons of Anatolia. However, that will be a project for much later. 🙂 In the meantime, here’s some more information about the image I used at the top of this page. In Hittite mythology, Illuyanka was a serpentine dragon slain by Tarhunt, the Hittite incarnation of the Hurrian god of sky and storm. It is known from Hittite cuneiform tablets found at Çorum-Boğazköy, the former Hittite capital Hattusa. The contest is a ritual of the Hattian spring festival of Puruli. The myth is found in Catalogue des Textes Hittites 321, which gives two consecutive versions. Name: Illuyanka is probably a compound, consisting of two words for “snake”, Proto-Indo-European *h₁illu- and *h₂eng. The same compound members, inverted, appear in Latin anguilla “eel”. The *h₁illu- word is cognate to English eel, the anka- word to Sanskrit ahi. Also this dragon is known as Illujanka and Illuyankas. Narrative: In the first version, the two gods fight and Illuyanka wins. Teshub then goes to the Hattian goddess Inaras for advice. Having promised her love to a mortal named Hupasiyas in return for his help, she devises a trap for the dragon. She goes to him with large quantities of food and drink, and entices him to drink his fill. 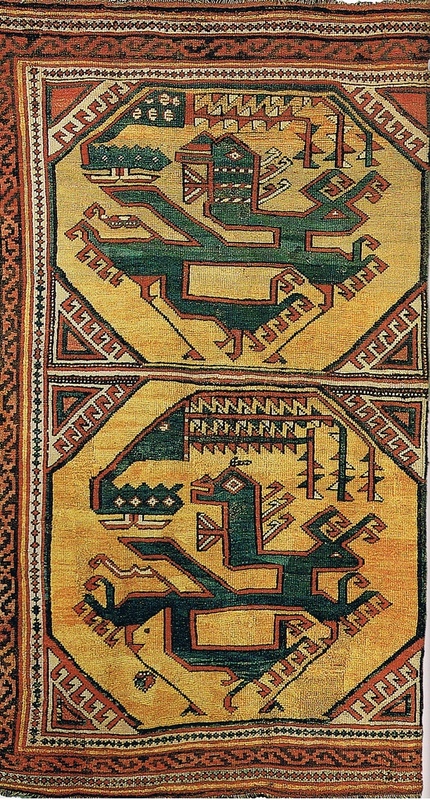 Once drunk, the dragon is bound by Hupasiyas with a rope. Then the Sky God Teshub appears with the other gods and kills the dragon. In the second version, after the two gods fight and Teshub loses, Illuyanka takes Teshub’s eyes and heart. To avenge himself upon the dragon, the Sky God Teshub marries the goddess Hebat, daughter of a mortal, named Arm. They have a son, Sarruma, who grows up and marries the daughter of the dragon Illuyanka. The Sky God Teshub tells his son to ask for the return of Teshub’s eyes and heart as a wedding gift, and he does so. His eyes and heart restored, Teshub goes to face the dragon Illuyanka once more. At the point of vanquishing the dragon, Sarruma finds out about the battle and realizes that he had been used for this purpose. He demands that his father take his life along with Illuyanka’s, and so Teshub kills them both with thundery rain and lightning. This version is illustrated on a relief which was discovered at Malatya (dating from 1050-850 BC) and is on display in the Museum of Anatolian Civilizations in Ankara, Turkey. So, all this from a dream …not quite sure what the point of it was but maybe that “light bulb moment” is yet to come. This entry was posted in Dragon Myths & Stories, Dreams & Whispers and tagged Anatolia, Anatolian Dragon, dragon, Illuyanka.